This is not your ordinary muffin! 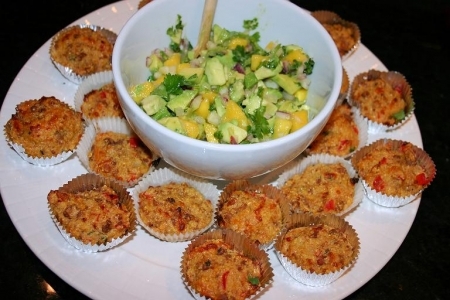 These are mini muffins served with a Mango Avocado Salsa and have a wonderful kick to jump start your day! They are also great for a brunch or maybe as an unexpected addition to your favorite chili recipe. This recipe uses a yellow corn bread mix, so make sure you have the additional ingredients that the package calls for. If making the Mango Avocado Salsa make sure you have the ingredients it calls for. If serving with Mango Avocado Salsa make and refrigerate. In large skillet heat olive oil over medium high heat and sauté chorizo sausage, onion and red peppers. While sautéing chorizo, try to break up any large pieces, because small pieces are essential. In a separate mixing bowl, prepare corn bread mix per package instructions. Once chorizo, onions and peppers are thoroughly cooked, combine with corn bread mixture. Add cheddar cheese and cilantro. Mix until well combined. Place mini muffin foils in muffin tray and spray the inside of each muffin foil with the non-stick cooking spray. They will stick to the foils if not coated with the non-stick cooking spray. Fill each foil with corn bread mixture ¾ of the way. Bake in a preheated oven at 425 degrees for 10 minutes. Serve with Mango Avocado Salsa or solo and enjoy!